Do you find yourself forever leaning towards the same ground fabric every time you start a new embroidery project? Do you gravitate towards the same basic color schemes? 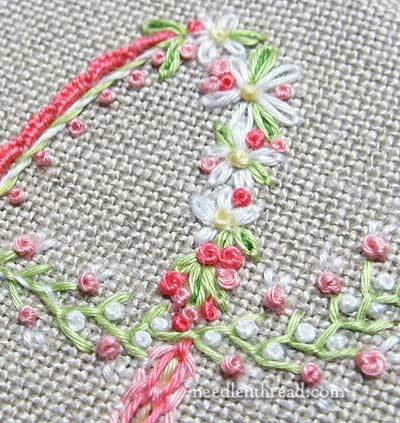 Do you find yourself resorting to the same set of embroidery stitches each time you tackle something new? You aren’t alone. I think for many hobby embroiderers, this is the case. It’s definitely the case for me. I gravitate towards linen, and normally, it’s white or natural colored. I generally select very similar color schemes for my projects. And I rely on my tried-and-true favorites when it comes to selecting stitches. I’m not saying this propensity towards a particular set of anything is good or bad, because it’s neither, necessarily. If your whole reason for embroidering is that it gives you pleasure, and you find pleasure in your particular customary choices, then that is great! When it comes to free-style surface embroidery, though, one of the many pleasures that it affords the stitcher is variety. So many ground fabrics! So many possible color combinations, so many possible threads and textures to choose from, and oh-so-many stitches and stitch combinations! And yet…. and yet…. I still have my favorite ground fabrics. My favorite color schemes. My favorite stitches and stitch combinations. The two photos above remind me of summer. They remind me of pink lemonade. Of watermelon. Of bright sunshine. Part of this is because they are worked on a white linen ground. The white linen brightens the colors up and makes them intense. Change the ground fabric to a natural linen, keep the same color scheme, throw in some white, and voilé! Still bright and chipper – but not quite “Summer”. Spring. But not summer. It doesn’t have the same bright-sunshine-intensity with the natural background. Keep the same stitches, change the background to a creamy, yellowy off-white, and change the thread color scheme, and a whole different look develops. It’s a bit muted (though the blue livens in up a bit). Ground fabric, thread types and colors, stitch choices – these are the things that keep free-style surface embroidery from ever becoming dull. If you’re wanting to mix things up a bit from your normal customary choices, try switching your ground fabric. Try a new linen! Try new threads! Work in a couple obscure stitches or combinations. Get adventurous with a color scheme! It’s therapy, I tell you. Therapy. I love the example in this post. So delicate and beautiful. I’ve always been afraid to stitch on linen! Prior to discovering Brazilian embroidery I didn’t think much about the ground, but now I am wanting to expand more and it is confusing. Linen always looks so rough! And cotton looks tough. I think I need to spend more time looking at fabric and then just dive in. I really like your example so pretty is it a monogram. 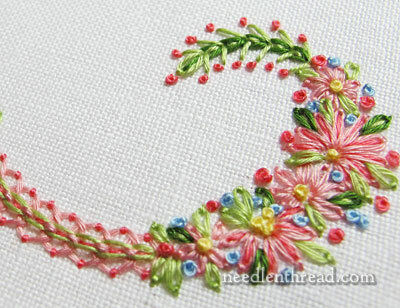 I love the first photo with the colour combination of the threads and the grouped flowers and pretty French Knots lovely. Yes I agree I tend to use the same threads which for me is Soie silk threads as I like the sheen and the feeling of the thread. I wish I could design my own pattern and coordinate relevant stitches to suit the pattern, I need to do a course in creating my own pattern and using the relevant stitches which suit a particular design. After finishing my Guardian Angel I’m at odds of what project to start next, shall I start the Little Things which I’m dying to attempt, or shall I continue with my original idea of cutwork (which I’ve not done before) or shall I follow you on the Mission Rose Oh decisions, decisions! Love the close-ups of the monogram! Where could one find ground fabrics? Your embroidery is just exquisite! I love it all. But my big dilemma in addition to being able to come up with my own designs, is what to use it for? I can only hang so many pretty things on my walls, embroider so many monogrammed handkerchiefs, etc. I don’t want to invest all that time and energy into something that will just sit in a drawer or be thrown away by my children when I am gone. I’m too practical to make it “just because.” What is the ultimate end of your projects? Delighted to read Ground Fabric, Thread Colour, Stitch Choices- it’s something I’ve been thinking about a lot. The insights and photos are helpful and lovely. Thank you! Mary, I also tend to stick with the same fabrics and thread colors. I had not really given it any thought before reading your blog post today. There have been times when I have tried to use other color schemes, but then I become distrested with the work and set it aside, going back to my “normal” fabrics and colors for the embellishment. I try to incorporate some of Carole Samples drawings into each piece I work on, and I have been collecting graphs from pieces that I see online or in magazines that I really like. I print the information out so that I have the internet addresses on the same page, or the magazines that see. Again, thank you for waking me up to my own shortcomings! I know what you mean Mary. As crazy quilting was my introduction to embroidery I have worked on many different colours with many different colour schemes, but recently I embroidered a monogram for a friend. Her favourite colour is green, so I used what I had which was a bottle green dupion silk. I know most people dislike working on this because of the slubs but it didn’t really bother me. I worked the initial in long and short stitch in ivory silk with some purplish and green wisteria stems twined around it. 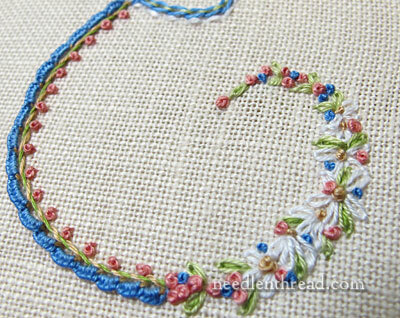 It looked quite pretty, but the less said about my embroidery the better although the recipient was over the moon. They say we are our own worst critics. 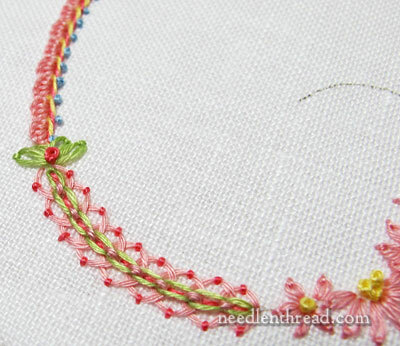 I am kinda new to embroidery and I wanted to know if you could list some of the stitches you used in the ground-fabric-thread-color-stitch example. I love how you used the swirl as the design line and put in so many different stitches making it flow. Thank you for sharing. What type of fabric do you recommend for kids’ first embroidery samplers? I am teaching a class to grades 6-8. We have a pretty low budget for materials. I was wondering if a good, bleached muslin would be acceptable for both the backing and ground fabrics. Thanks! Perfeito os bordados .gostaria de aprender .